The Royal Vauxhall Tavern in south London has just been awarded Grade II listing status for its LGBT past—a first. But its future is still far from secure. It is surrounded by glass and steel examples of London’s relentless gentrification and property development. But on Wednesday the future of the Royal Vauxhall Tavern in South London, built in 1860-62, appeared a little more secure after it became the first ever building in the U.K. to be given a special “listing” status based on its LGBT history. The move followed a similar historic designation conferred in June on New York’s Stonewall bar, site of the eponymous 1969 riots. The RVT, which currently houses the popular Saturday club night Duckie, stands on the site of the old Vauxhall Pleasure Gardens and is London’s oldest surviving LGBT venue. Heritage Minister Tracey Crouch said: “I am thrilled to be able to list the Royal Vauxhall Tavern as Grade II—the iconic cultural hub in the heart of London is of huge significance to the LGB&T community. Not only of architectural interest, the venue has a longstanding historic role as a symbol of tolerance and alternative entertainment. The venue’s future has been in question after it was sold last year to Austrian conglomerate Immovate, which campaigners suspect wants to demolish the RVT and turn it into luxury apartments. Uncertainty over the RVT’s future came amid a wave of closures of other much-loved LGBT bars in and outside London. A campaign group, RVT Future, was formed, seeking to safeguard not only the building but its use as an LGBT space. First the group was successful in securing Asset of Community Value status, which means the use of the building cannot be suddenly changed and allows campaigners to bid for it should it come up for sale. The Grade II listed status accorded this week to the RVT by the DCMS on the advice of Historic England makes it harder to demolish or radically remodel the venue. Besides its LGBT history, the building has a mid-Victorian curved façade, cast-iron columns, and other original fixtures. Duckie is one of London’s most distinctive and cherished LGBT club nights, attracting a diverse, mixed-gendered crowd who dance and drink to a deliciously anarchic song list—ranging from The Smiths to Barry Manilow. Lamé joked that the RVT’s customers—or “punters”—could come to the RVT and see a brilliant act perform on its stage, or one that would make them want to hurry outside for a cigarette: that was the beauty of the place. The campaign to save and safeguard the RVT has attracted the support of London’s Mayor Boris Johnson, as well as celebrities including Sir Ian McKellen and TV star Paul O’Grady, who honed his legendary, brilliantly foul-mouthed drag queen creation, Lily Savage, at the RVT. Should Immovate now want to sell the building—fed up of the “uppity gays” obstructing it—RVT Future or a community group would form to buy the building and turn it into an LGBT center, with the pub still on the ground floor and meeting rooms upstairs for groups, as well as a space given over to London’s LGBT history, Lamé said. 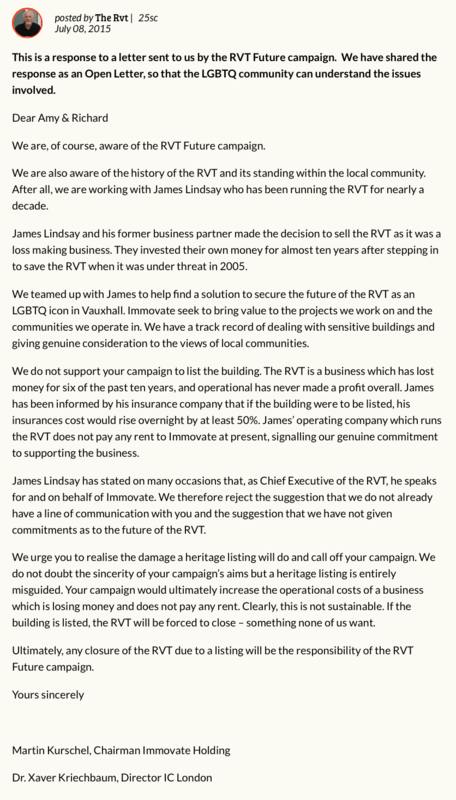 She disputed Immovate’s contention, contained in a letter sent to RVT Future in June, that the venue had lost money in six of of the last 10 years. Immovate had also called on the group to cease its campaign of trying to get the venue listed, because should such a campaign prove successful, the building’s insurance costs would rise by 50 percent overnight. If the building was listed, the business would be forced to close, Immovate warned—which would then, said the company, be the fault of the campaigners trying to save it. The group dismissed Immovate’s claims. Lamé told The Daily Beast that official documents showed the RVT had turned a profit in 2006, 2007, 2009, 2010, 2011, and 2012. In a stinging return letter, the campaigners told Immovate that “hundreds of London pubs and businesses operate successfully out of listed buildings.” The group would not capitulate to Immovate’s “bullying and blackmail,” it added. James Lindsay, chief executive of the Royal Vauxhall Tavern, who runs the venue for Immovate, having sold the pub to the company in 2014, was disappointed by the listing decision. In a statement, he wrote: “Historic England have accepted the building probably should not be listed on its architectural merit alone, but more because of its use. 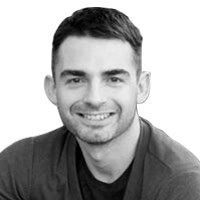 “The use of a building can change, and gay venues across the UK have recently been closing at an alarming rate and there is a good reason for this. As for Lamé, she told The Daily Beast she was heading to the RVT for “lots of drinks” with friends and supporters.